Clockspot gives you full control over user permissions, so you can configure exactly who has access to which features. To edit a user’s permissions, go to Users > Choose a user > Permissions tab. There are three roles you can assign: employee, manager, and owner. Employees clock in and out, and show up on timesheet and payroll reports. By default when you sign up you are assigned the manager and owner roles. If you also want to clock in/out, and want to see yourself on the timesheet and reports, you must enable this role for yourself. Managers can view and edit other employees’ timesheets, as well as pull payroll reports and manage PTO. If your manager also clocks in and out, you can assign both employee and manager roles. Owners can manage the Clockspot account itself, like canceling the subscription, and paying the invoice. 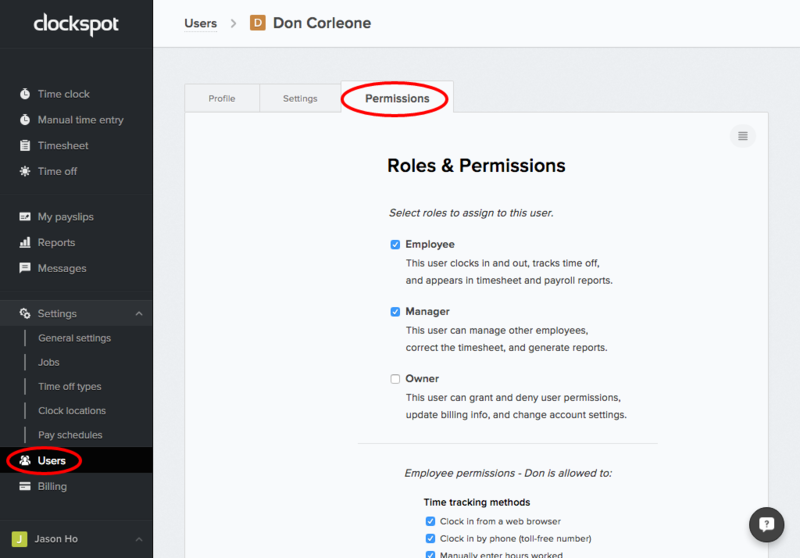 Most importantly, they can edit other user permissions, which essentially makes them a super user. Make sure to click ‘Save changes’ at the very bottom once you’re done. To quickly select or deselect all permissions, click on “Actions” and then click “Check all” or “Uncheck all”.